Reaffirming the superiority of the Chief Justice, the Supreme Court today dismissed a petition which questioned the unilateral power of the CJI to constitute benches "arbitrarily" and allocate work to different benches and which sought framing of proper rules for it. 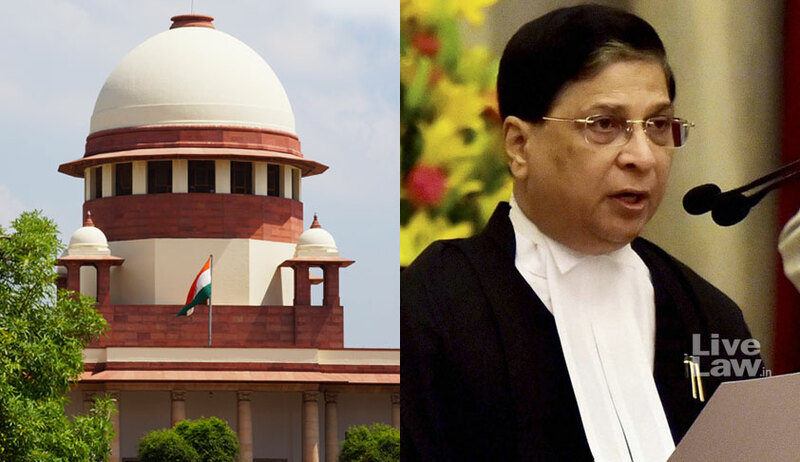 Rejecting all allegations of "arbitrary allocation of work" and stressing that CJI was the highest constitutional authority, the judgment said CJI had been entrusted the power to constitute benches and allocate work to different benches as he has been trusted by the constitution to be at the helm of affairs of the Supreme Court. The judgment was written by Justice D Y Chandrachud who was part of the bench along with Chief Justice Dipak Misra and Justice A M Khanwilkar. Reading out the operative portion, Justice Chandrachud termed the petition filed by a Lucknow-based lawyer Ashok Pande as "scandalous". "From the institutional perspective, Chief Justice is at the helm of affairs of the Supreme Court. Chief Justice is an institution himself", said the judgment. "He is the head of the Supreme Court and the authority is entrusted for the efficient transaction of the affairs of the Supreme Court and there cannot be a presumption of distrust",it said. "The responsibility thrust on the Chief Justice is for the safeguard of the independence of the judiciary", it said. The order comes at a time when the row over the assignment of cases in the apex court and role of Chief Justice Dipak Misra rages following the press conference by four senior-most SC judges. The bench of Chief Justice Dipak Misra and justices A M Khanwilkar and D Y Chandrachud was passing orders on a petition filed by a Lucknow-based lawyer Ashok Pande seeking a mandamus to the Registrar of the Supreme Court to evolve a procedure for constituting benches and allotment of jurisdiction to different benches. Says advocate Pande’s petition: “the petitioner seeks a writ of mandamus to the first respondent (Registrar of the Supreme Court) to evolve a set procedure for constituting benches and allotment of jurisdiction to different benches in Supreme Court”. He also sought a writ of mandamus to the High Courts to evolve the set of rules on the pattern of rules so framed by the Supreme Court. The petition also seeks a mandamus to the Supreme Court Registrar to have a specific rule in the supreme court rules that the three judges bench in chief justice shall consist of Chief justice and two senior most judges and the constitution bench shall consist of five senior-most judges or three most senior and two junior most judges. “With the press conference of the four senior-most judges of the supreme court the matter of preparation of the set rules governing the powers of the chief justice with respect to the formation of benches and vesting of jurisdiction came in public domain and hence this petition is in national/public interest”, it said. The three judges bench in the Chief justice court should consist of the Chief justice of India and the two senior most judges. In court number two the division bench of the judges at number four and five of the seniority and in court number three the bench of judge at serial number six and seven of the seniority should be formed and same practice should be followed in the constituting of all the benches. The Constitutional Court should sit only in the chief justice court and the judges at number 2,3,4 and 5 should be member of it. If the Constitutional Court is to of seven judges, they should be senior most seven. Till any matter of the Constitution bench is pending for consideration, the Constitutional Court should be permanently constituted and the judge should concentrate on Constitutional matters pending with supreme court and should not hear any other matter. For other matters the Supreme Service Court, Supreme Tax Court, Supreme Criminal Court, Supreme Land Disputes Court and Supreme Miscellaneous Matters Court should be constituted and all the matters of that jurisdiction should be listed before that bench. All the judgement and orders should be dictated in open court by all the three judges or both the judges of the bench alternatively. The chief justice should form the bench with the judge at number two of seniority and the bench of the judge at serial number three should be with number four. The senior most five should sit with number six and seven with eight. The bench of the judges coming from District court judiciary should be formed only with the judges coming from District court judiciary as per the seniority. All the judges of the bench should dictate the order alternatively. All the judgement should be dictated in open court and if are being reserved for any reason, then should be dictated in the joint sitting of all the two, three, five or seven judges. This sitting can be organised at any place including the residence of any judge or in the high court itself. All the judges are having equal rights, authority and privileges and so the practice of saying that the bench headed by judge A B or CD should come to an end. questioned the manner in which CJI allocated cases “selectively” to “benches of his preferences”. In a letter to the CJI divulged at the press meet, they also alleged: “cases having far-reaching consequences for the nation and institution had been assigned by CJI selectively to the benches of his preferences”. They had contended “things are not in order” and “many undesirable things are happening”. They had said CJI, though a master of the roster (one who decides which bench will hear which case) was exercising the power arbitrarily. Though Master of Roster, he is only ‘first among equals’ and not a superior authority. But he behaved like one, they alleged. “Members of any multi-membered judicial body including this court would not arrogate to themselves the authority to deal with and pronounce upon matters which ought to be heard by appropriate benches”, the judges had said. “Any departures would not only lead to unpleasant and undesirable consequences of creating doubt in the body politic about the integrity of the institution”, they had said. Last week Senior advocate and former Law Minister Shanti Bhushan filed a PIL in the Supreme Court seeking clarification on the administrative authority of the Chief Justice of India (CJI) as the master of the roster and for laying down the principles and procedure to be followed in preparing it for allocation of cases.